Becoming a temple priestess may be an honor, but Tibi can’t bear to surrender her freedom or her newfound faith. Alexius’s solution stuns her. Marriage…to a gladiator! Scorned by her noble family, Tibi always felt unworthy. But with her champion by her side, can she accept—and give—a love strong enough to vanquish their enemies? Quintus Ambustus is a slave–Adiona Leonia is a wealthy socialite. 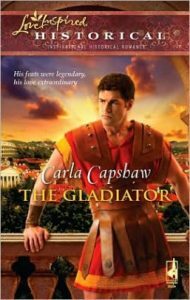 He fights for his life in the gladiator’s ring–she plays cutthroat politics in Rome’s high society. He’s sacrificed everything for his Christian faith–she believes in nothing and no one. 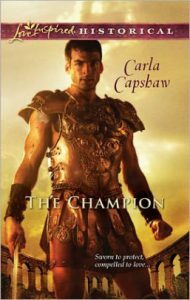 But when Adiona’s life is threatened, Quintus is chosen as her bodyguard, and their fascination with one another shocks them both. Neither thought to find joy in a match society would condemn…but their feelings cannot be denied. Have they lost too much to believe in happiness? Or will their growing love let them leave the past behind–and build a new future together? He won his fame–and his freedom–in the gory pits of Rome’s Colosseum. Yet the greatest challenge for once-legendary gladiator Caros Viriathos comes to him through a slave. His slave, the beautiful and mysterious Pelonia Valeria. 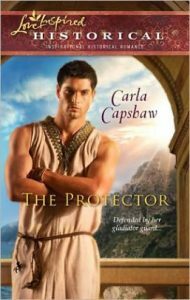 Her secret brings danger to his household but offers Caros a love like he’s never known…. Should anyone learn she is a Christian, Pelonia will be executed. Her faith threatens not only herself, but her master. Can she convince a man who found fame through unforgiving brutality to show mercy? And when she’s ultimately given the choice, will Pelonia choose freedom or the love of a gladiator? 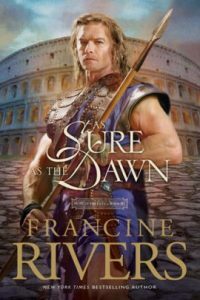 Atretes, a German barbarian who has won his freedom in the Roman arena, finds his life changed forever by an encounter with a young Christian woman. Atretes vows to move heaven and earth to find his son–the baby he thought was dead, and take him back to Germany. Only one thing stands in his way: Rizpah, the Christian widow who has cared for the child since his birth.